3 BNC to 3 RCA Component Style Premium Video Cable. Short Length of 3FT Ideal for Rack installations. Used to connect HI End Video Equipment. 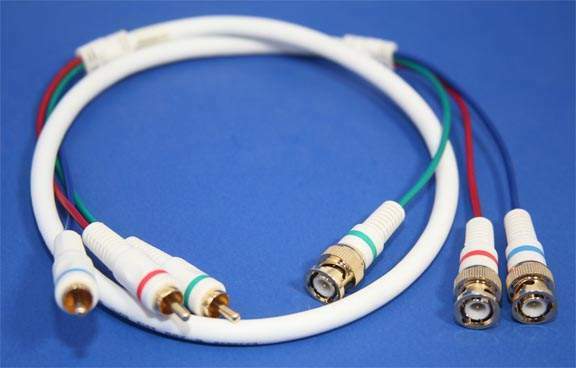 The BNC to RCA component video cable will not only support the fast 1080p signal but of course will support todays resolutions of 480i / 480p / 720p and 1080i so you can use them today will also support Higher Definitions. This 3 BNC Male to 3 RCA Male component video cable is made for high definition systems. They fully support component (Y, Cr, Cb) connections and have >10 tests performed on them before shipment to assure the pass a 148.5 Mhz high definition signal without any impact.